Using a potato peeler shave the asparagus into ribbons. Holding the base of the stalk with one hand, run the peeler down to the tip. I allowed some small tips to remain whole. Continue, rotating the asparagus 90° each time you shave, until each stalk is shaved through. Keep the ends to toss in to a stir fry or soup the following evening. 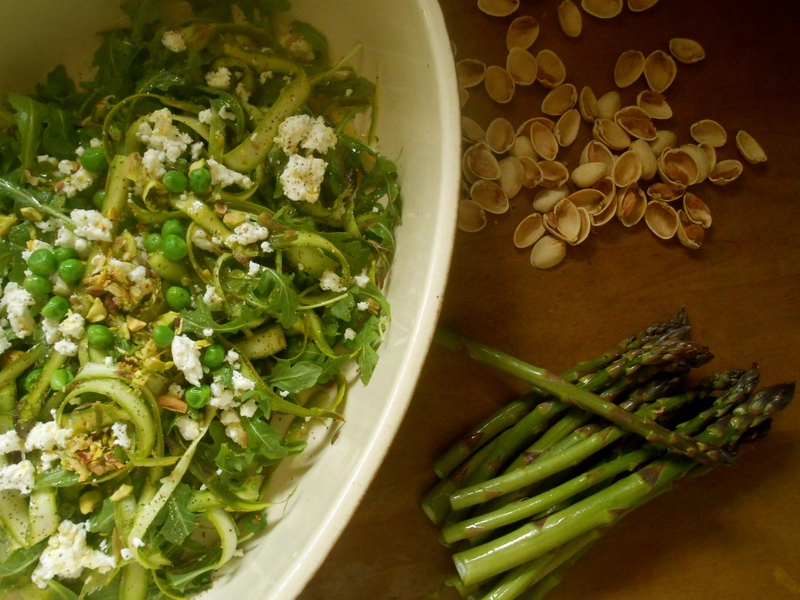 Toss asparagus ribbons with arugula, peas, pistachios, and feta. Dress with lemon juice and a generous drizzle of olive oil, and season with fresh ground pepper and a hit of flaky salt. Serve right away. Shaved asparagus means a lot of vegetable flesh surface area exposed to the elements, which can make your salad soggy if left alone. Don’t assemble this until right before you want to serve. Methinks this will be making an appearance at our Mother’s Day brunch! This will be a perfect salad on Mother’s Day! It has a very impressive appearance and it’s something you’ll love to share. This salad sounds so good. The weather is warming up here in California. It’s amazing I already have all the ingredients to make this and since its warming up to 87 degrees I will be having this for dinner tonite. Wish you were here to enjoy with me. I wish I was there too! Let me know how you like it. I bet you’ll love it Sue. I’m taking the summer off this year! :) Maybe we’ll make it to California finally. I love asparagus–sounds great combined with the feta and peas! Have you had it raw before? I was pleasantly surprised how nice it turned out. And you are right, the combination was great. Hi there! Nice to see you here today. Thank you for visiting and yes, you would love this. If you like asparagus hope you give it a go. Lovely salad. Very nice indeed. What a gorgeous looking salad – Spring on a plate. I’ve always adored shaved asparagus so lovely to see you’ve discovered it too. I’m probably really behind the times in just discovering shaved asparagus. :) It’s certainly delicious, I was really surprised. This post caught my eye – a really clever way way to prepare asparagus, I often find it’s hard to cook it just right (especially with the woody ends) so slicing and serving it raw is such a good idea – I’ll be trying this one! I’m glad to hear you like the idea! Have you even heard about snapping the woodsy part off? Someone showed me to hold the spear at the halfway point with one hand and pinch the woody end with the other and snap it. The spear that includes the tip is what should be eaten. So, the woodsy end, no matter how short or long is tossed in the compost because that is the tough woodsy part. It works! :) Let me know if you make the salad, would love to hear your opinion! Thanks so much – a great tip. I’m just waiting for the Australian season to kick in – can’t bring myself to buy asparagus that’s travelled across an ocean from Mexico! Even though I’ve been eating salads – by the bucket load – it’s so cold here I’m craving fried food again! Seriously, I’m going out of sync. It’s May in a couple of days. And I’m still wrapped up in winter clothes. Anyway, I still haven’t had asparagus this season. Is it really that good raw?! I get kinda nervous of trying things out, like raw Brussels sprouts in salad. Actually, I tried those and decided against it. :) Asparagus I will probably love. Oh, I had pea shoots for the first time this year in a – yet another – salad over the w/end. Those were delicious. With chard leaves, would you believe it. Yet they don’t sell chard! Huh. Argh, the endless winter! I’m not going to brag about the 75F / 24C day we are having today. It came out of nowhere because I had a down coat on yesterday, and tomorrow temps are supposed to drop back down. Puzzling. I have yet to try brussels sprouts raw for the same reason, a little nervous. But I can say I really liked the raw asparagus, surprisingly. Maybe the dressing, feta and other throw in’s had something to do with it. And pea shoots! I love pea shoots. You mean you can’t buy chard, yet you were able to have a pea shoot/chard salad? Spring, spring, spring! I missed our markets this weekend, but I think the asparagus is just beginning and should be here next. Can’t wait. What a lovely salad. :) thanks Margot, even though our seasons are opposite you always have such nice comments. We are having some strange weather patterns over here at the moment. Hot yesterday, cold & rainy today. I don’t know what to wear! Oh good! You will impress your dinner guests with this salad. Maybe consider making it once before Mother’s Day to make sure you’ll like it :/ Let me know what you think. It turns out our Mother’s Day brunch is canceled, darn it, due to my friend having to travel for work over that weekend. But I’ll make it anyways for my family and let you know what I think! A great recipe for all the asparagus I’ve been seeing at our farmers market! Sounds so refreshing! Love the hundreds of stalks of asparagus at the farmers market! It’s spectacular. Heck yes. That salad makes me excited!! Maybe served with your mussels? I’m still thinking them. Delicious! You have such a wonderful knack with vegetables Seana, this spring salad sounds fabulous. I’ll have to wait a while to try it out, but it’s bookmarked! The cauliflower from last week was sensational. I bought baby caulis, they cooked in about 30 mins, but we looooved the flavours! Don’t think I have ever seen baby cauli’s. I’m going to keep a lookout for them. I was eyeing purple romanesco the other day. Very interesting looking. I thought it would be a little too “showy” to cook and blog about! Ha! HI Seana– OK, I’ve seen recipes with shaved asparagus, but never been brave enough to do it! Thanks for the clear directions– this salad looks so bright and fresh– worth all that shaving!! thanks. Hi Rhoda, thank you so much! It really is worth all the shaving. It actually went pretty quick using a peeler. Using larger asparagus helps too. Glad you stopped in, thank you! I’ll let you know how it comes out! I think raw asparagus is a marvel, especially when it comes straight from the garden. This salad looks amazing! I don’t know why I have never tried it raw before, perhaps because I’m not too keen on certain vegetables raw…like broccoli and cauliflower. Raw asparagus is wonderful! oh… my…. god…. this looks impossibly beautiful. And wow…. i’ve never had a shaved asparagus salad…… but you have converted me. I just need a lazy sunday to do this!! Gorgeous, gorgeous, gorgeous. I told my class about this salad. It’s amazing how many people think that food is utilized only one way. Thank you,TWC! Love the combination of the fresh green vegetables! Pinning this one! Thank you Linda. This really is a wonderful salad. Very impressive, crisp and out of the ordinary of a usual salad. One word – sublime. A few more words – on my chalkboard menu. Thank you….. Thank you! :) I wish I could take all the credit for the ideas…it’s a fun way to put a salad together though. LOVE your post today. Gorgeous photographs and sounds incredible. This looks amazing! Adding it to the must make list! You are currently reading shaved asparagus salad with feta and peas at COTTAGE GROVE HOUSE.